The Resort is located in June Lake, California (just 12 miles from the eastern entrance to Yosemite National Park) and it is often referred to as “The Switzerland of California”. 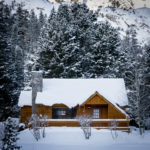 The Double Eagle is nestled among rushing streams, towering pines and a glistening pond all seated at the base of 11,000-foot majestic Carson Peak. There are four alpine lakes within eight miles offering many outdoor adventures, hiking, backpacking, boating, horse-back riding and the best fishing in the Sierra. Accommodations feature cozy 2-bedroom cabins and luxury rooms which are beautifully appointed with every amenity to ensure guest’s complete comfort and relaxation. Each cabin or luxury room has its own deck, all with breathtaking views. 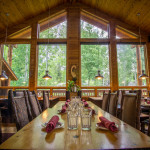 All cabins have fully-equipped kitchens and fireplaces. Each luxury room has its own private whirlpool tub and overlooks a pristine fishing pond. This four-season destination resort also features the Creekside Spa providing over 40 Spa treatments to ensure complete relaxation and revitalization of guests and visitors. The fully-equipped fitness center offers guests a stimulating workout in a peaceful, yet tranquil, environment. The 60 ft indoor pool and adjacent co-ed whirlpool provide a unique opportunity to share special time with family and friends: a perfect getaway! The Creekside Boutique and gift shop features unique gift items and sports apparel. Spa hours are 7 am – 9 pm daily. The Eagle’s Landing Restaurant and Eagle’s Nest Saloon offer the best views in the Eastern Sierra – waterfalls, jagged mountain peaks and rushing streams as well as fine dining. Resort guests and visitors enjoy menus designed to please the most discerning palette. The Eagle’s Nest Saloon is a full-service bar with a distinctive selection of great wines and aperitifs. International visitors often choose to stay at the resort prior to going into or out of Yosemite National Park. Day trips to Yosemite National Park are also easily done from the Double Eagle Resort and Spa.